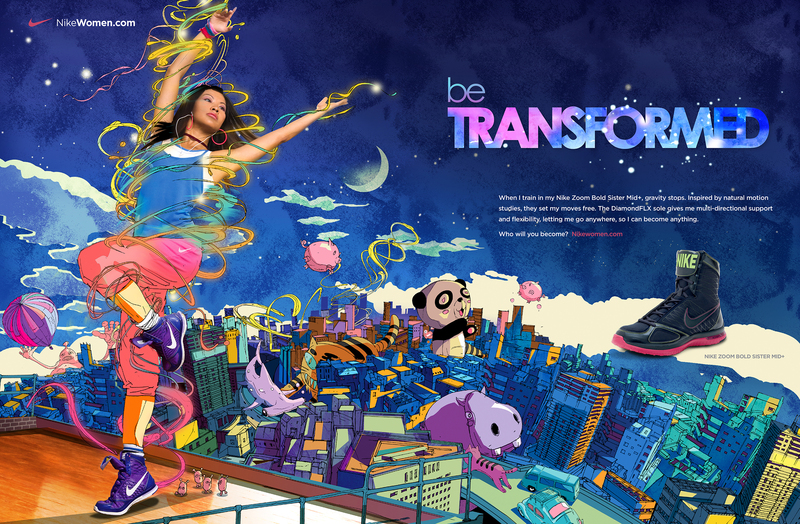 Nike is running an online advertising campaign for Nike Women, Be Transformed, featuring women whose exercise takes on extra power with the aid of animation. 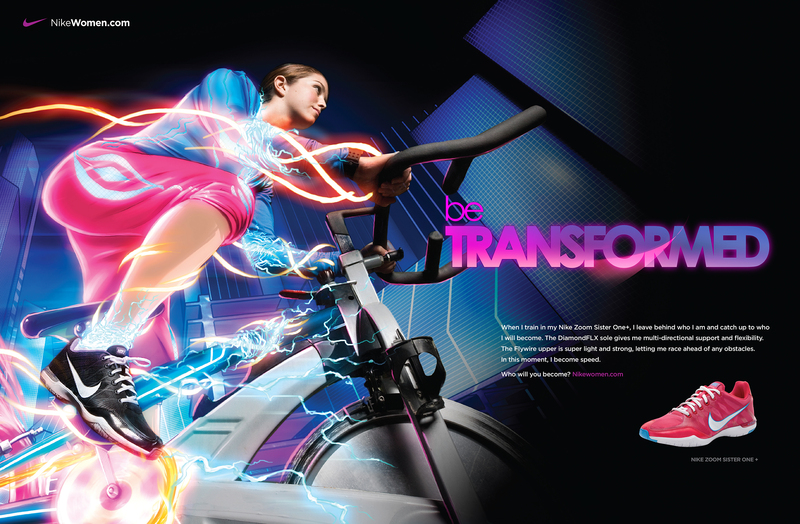 Punching Bag, Jump Rope, Meteor and Bike all show the transforming power associated with the Nike Women brand. Featured throughout the campaign is the Nike Zoom Sister One+, a bold shoe that incorporates some of Nike’s most innovative technologies. Inspired by the dynamic movements of today’s women’s training programs, the Nike Women design team created a product with lightweight support for their multi-directional training. An essential tool to their transformation, it was designed to help women to become stronger while remaining agile. AKQA and Nike commissioned Curious Pictures and I Love Dust to create these ads using a collective of international animators and illustrators. Each video is visually unique and draws on a variety of animated styles that reflect the personality of the different shoes in the Zoom Sister series. The nikewomen.com digital experience allows users to browse Nike’s range of products and explore the innovations behind the Zoom Sister series. The site also profiles the featured athletes through video and blog content and allows girls to set individual training plans to help aide their personal transformation. 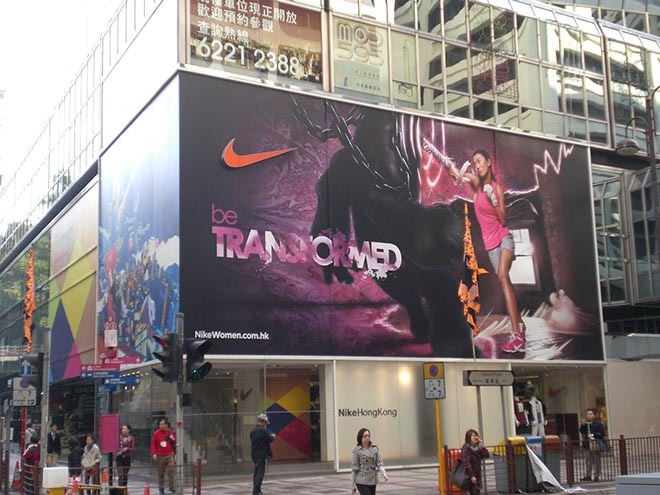 This campaign also features a prominent 110-meter long building wrap of Beijing’s International Plaza, one of the largest and most prestigious department stores in the city. Sonia Kong’s boxing routine takes on new significance as she battles the powers of darkness. Mel Lozano takes her jump rope routine into higher and higher realms of fantasy, introducing her to new creatures and sights never seen before. In “Meteor” Hannah Lo’s kickboxing practice jumps into cosmic mode as she rescues the planet from impending doom. A woman races the pack on her gymnasium exercycle, entering the velodrome and racing to victory. In “Electronica” dancing allows Flora Hon to tell her story without hiding anything. She uses movements instead of words to express herself. Videos have been removed due to the expiration of Nike’s contracts and global licensing. 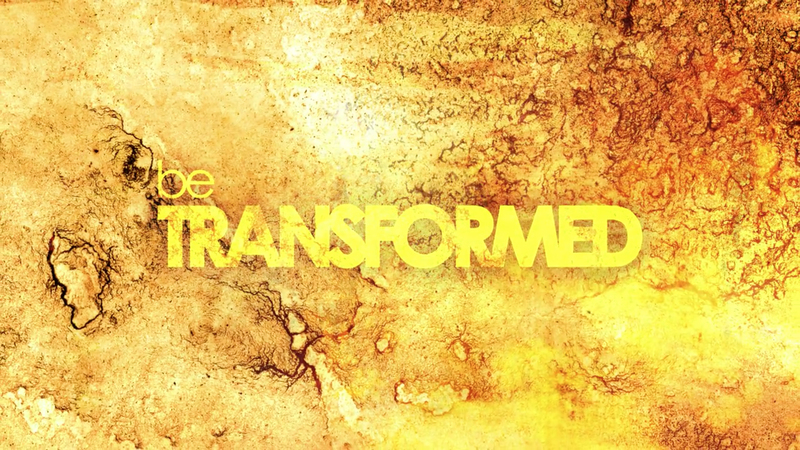 The Be Transformed campaign was developed at AKQA, San Francisco, by creative director Neil Robinson, associate creative director Steve Clements, art directors Chantal Mora and Ian Aldous, senior copywriter Bob Hall, copywriters Ellen Karas and Stephanie Kodeck, executive producers Mazen Haddad and Nancy Cardillo. Animation for Punching Bag, Meteor and Bike was developed at Humouring The Fates, Tampa, Florida, by lead animator Jesse Norton and live action producer Shannon Lords. Electronica was directed and produced by Golden Wolf. Music is Repair Machines by Vitalic.